I offer organic SEO (search engine optimization), website redesigns, custom designs and maintenance to Christian businesses or ministries as well as In-Depth SEO Analysis Reports. My main goal as a Christian is to be as honest as possible in all my dealings and to deliver what I promised. I have been a Christian since May of 1982 (after reading Hal Lindey's Late Great Planet Earth) and a professional Christian web designer since 2000. I learned most of what I know about the Bible through Calvary Chapel where I attended for over 20 years. Being raised in a cult, I studied up on all the cults, after becoming a believer and focused on bible doctrine for the next 20 years. My own Christian poetry, songs, stories and bible studies including: What Day of the Week was Christ Crucified? Managed a Christian mailing list witnessing to ex-Jehovah's Witnesses for 3 years discussing Bible prophecy. 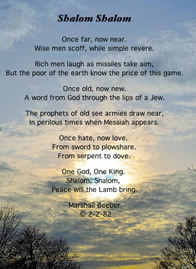 Managed another Christian mailing list called Tcode (Torah Codes), discussing the Bible Codes with the world's top notch Bible Code experts on the list which we proved could not be of God due to the "codes" being found in the daily newspaper plus "Yeshua Ha Mashiach", aka "Jesus Christ" was never found in the Bible Codes. I also attended messianic groups and studied Hebrew for two years while pursuing the Bible Codes. You can see a collection of Negative Bible Codes where codes were found that refute the validity of the bible codes. Volunteered on the PropheZine website as a web designer and eventually as Senior Editor for the online newsletter. where I have critiqued the writing of those who call themselves prophets. Reasons for Hope a youth ministry led by Carl Kerby, a former board member of Answers in Genesis giving biblical answers to real-world questions, leading people to the only true hope, Jesus Christ. Watch his video: deBunked - No Evidence For God! Chuck Missler's Koinonia House Topics ranging from prophecy to current events, to practical Christian living. Lamb and Lion Ministries a Bible prophecy ministry of Dr David Reagan proclaiming the soon return of Jesus Christ. Hal Lindsey A news site dedicated to news analysis of current events from the perspective of Bible prophecy. Les Feldick One of the best bible teachers I've ever listened to who is able to determine which scriptures were meant for Jews and which for Christians. See other sites I have designed or redesigned in my Mobile Web Design Portfolio. I believe that man was created perfect but that through Adam's sin all men (and women) are fallen and we need the saving Grace of Jesus Christ to wash away our sin through the blood he shed on the cross on our behalf. I believe in the Trinity--that God, Jesus Christ and the Holy Spirit are all God and they are one God with separate persons. Jesus was born through the incarnation, sinless, and he never once sinned in his whole life and this was the reason he qualified to be the Savior of mankind when he died for our sins on the cross. After Christ's death and burial I believe He rose again on the third day with a glorified body and is alive today in Heaven. It is only through God's Grace because of our faith in Christ's death on the cross for our sins that we are saved (Eph. 2:8.9) and there is nothing we can do to earn that salvation, except believe It's That Simple. Also see Saved by Grace Thru Faith showing that both faith and repentance are a gift from God (Eph 2:8.9; 2 Tim 2:25). There's a lot more that I believe so feel free to ask if you want. or call Lori at 509-397-6000 for more information.